Maybe you’re not aware that at Curious City we’ve got a few ground rules, and one of the biggest is that our producers and reporters don’t take on questions about the station itself. In fact, we usually drop ‘em right away. But given the spirit of the season (it’s, ahem, the end of WBEZ’s fiscal year), we thought we’d break that cardinal rule. 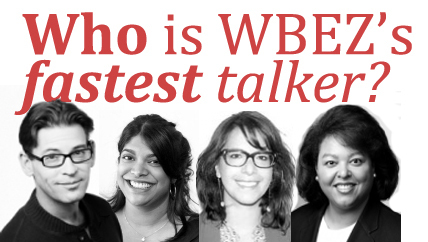 Who&apos;s the fastest speaker at the WBEZ station? Can you challenge them to find out? Kristen said she had her bets on Jill Egan, one of our traffic reporters. “But it’s just never been tested before,” Kristen told us. She was also particularly curious to know how the people she hears from most frequently on air — Melba Lara, Niala Boodhoo, Jennifer Brandel and Jill Egan — match up against each other. And what’s a little competition among friends? WBEZ is committed to giving you content without the fluff and ads you hear on other stations. On June 30th, WBEZ will end its fiscal year. As a non-profit organization, WBEZ strives to raise enough money to pay our bills each year. Our largest source of funding comes from listeners just like you. For the last eleven months, WBEZ members have donated over seven million dollars. We just have one million more to go to end the year in the black, and that’s where you come in. Support your local, non-commercial radio station by giving $15 dollars a month for the shows that get you through your day, like This American Life, Wait Wait Don’t Tell Me, Worldview and Re:Sound. Show us you care. Help WBEZ finish out this fiscal year by donating online at wbez dot org slash donate. You can also call 1-888-915-9239 right now. That’s 1-888-915-9239 for a $15 dollar amount. And thanks. Here&apos;s our on-air, Morning Shift smackdown in which Tony Sarabia tries to take the title. We’re not entirely sure what these results mean, but we do know this: The crown for the fastest talker at WBEZ can go to Curious City’s own Jennifer Brandel. That is ... at least for now. And if anybody wants a rematch (or you want to take a stab yourself, by posting your submission to soundcloud.com and tagging it with “WBEZ” and “Curious City”) ... Bring. It. On.